Well, nothing could be further from the truth. As I’m writing this, Shawn leads the Eastern league in MMP and MMP, and is second just behind some “Graziano Dude in both MIB and MIP. Patty is currently Eastern League third in MIP and MIB, and first in Open Team Dual-Line Ballet as a part of “Smitty & the Girls.” While they’re no slouches on the field, they also make some of the best competition sport kites around in the Vipers – and now the new Tantrums. In addition, and perhaps more important than scores or even kites, both the Tinkhams are genuinely “nice” people, spreading positivity wherever they go – and having loads of fun in the process. Shucks, we can’t think of a better pair of kiters to feature. Hi, Shawn and Patty. Let’s start this thing off the easy way. First off, tell us about yourselves… Where did you grow up? When did you meet and where? What do you do to pay the bills these days? I grew up in Danvers, MA, about 25 miles north of Boston. Patty grew up in Saugus, MA, which is about 10 miles north of Boston. We met in 1985, when we both worked at a local restaurant chain. Now we still work together, only we have become involved in the veterinary world. We work at a clinic in MA, that that deals with both large and small animals. Next – How did you discover kiting? Yeah, we all flew those dime-store specials as kids, but how did you get into the serious kiting stuff? And then how’d you make the transition from casual fliers into full-blown competition pilots? In 1997, Patty’s father was stricken with Cancer. As the illness progressed, there were fewer and fewer things that we could do with him. I bought a bunch of small plastic kites, at a local store. I think I paid .25 each, as they were on a clearance table. We would pick him up and take him to the beach, in Nahant, MA a few times a week. They had picnic tables and he could lie on the table and fly the kites. It really became a highlight of all of our days. A local club also flew at this beach, and as I looked around I saw my first sport kite. Too shy to approach them, I went to the local toy store to buy a kite. Needless to say, it didn’t fly very well. One of the local flyers, Eddie Webb, came down to help me with the ill adjusted kite. It finally flew and I was hooked. Without his help, I may have just “tossed” it and found something else. After getting my first “real” kite, a Total Eclipse, I flew whenever I could. Someone told me that they had a local competition and that I should try it. I haven’t stopped since. Okay, so what drives you to compete? Who are some of the people who influenced and inspired you, and who stepped up to the bar and actually taught you how? Tell us the kind of effort that went into that transition to competition caliber pilots, and how much you currently practice/fly. I guess that I’ve always been competitive at things. Before kites, it was Radio Control cars and show horses. This was just a natural thing for me. We went to watch at the Newport Kite Festival. This was my first real kite event. One flyer in particular caught my eye, Scott Weider. He wasn’t doing a lot of tricks, just showing the most control of a kite that I had ever seen. He seemed to have a way of flying that made even a straight line, look dramatic. I was going to learn to fly like that, no matter how long it took. I guess he was my first real influence. I mostly taught myself, as there weren’t a lot of competition flyers near me. I was lucky enough to have a very patient wife. She went every time, even though she didn’t fly at the time. Eventually, she got her own kite and started to fly. This helped both of us, as we could critique each other’s flying. We would fly whenever we could and take turns being “the judge”. Patty, it’s hard not to notice that you’re a fine young woman in what is predominantly a male-oriented sport. Has that proved to be a challenge for you, and if so – what are the difficulties and how do you deal with them? And also, are there some benefits to being a woman on the sport kite circuit? I really don’t see it that way. I’m just another pilot. Once I’m on the field, I want to do as well as I can. I never really looked at it as a male/female thing. Shawn, by the same token, does competing alongside your wife set you apart from the other male pilots, or affect you personally? Any challenges for you there? There really haven’t been any challenges. We work very well together. I do tease her about her not being able to beat me but, she has done that on many occasions. One of her first events, she had done very well, and I had had “one of those days”. On the way home, I asked for the map. Her reply was that it was in the back seat, under all of her trophies. One of the best things about it is that we never have to worry about getting a crew person. A question for both of you… How do each you go about building your comp routines? Do you simply sit down and write one out, or does it start with the music, or do you just “wing it”? I write the routines for both of us. Generally, it starts with the music. I find that I listen to most music now, trying to see if it would make a good routine. It’s hard to follow a movie, if you spend most of your time checking out the soundtrack. After a bit, I sit down and write out a rough sketch. This is mostly to make sure that it isn’t repetitive and that I am using the whole window. When that’s done, I go out to fly it and make any corrections to things that don’t work. There is some work involved in making sure that you could do it in any wind. Okay, now let’s address what might be a “touchy” subject. Those of us who live on the West Coast are amazed at the distances you Eastern League people travel to compete. Can you tell us how you two handle to difficulties of getting to all those required events so far away? Not really touchy. It was what I knew. I wanted to compete and that’s where they were. No doubt, it gets expensive. We are currently looking into ways of possibly making some changes. Being in NH makes it even tougher than for most, as many of the events are at least a six hour drive. There also are some that are too far to drive and involve flying to them. Sometimes, the logistics of those, are challenging. Okay, time for us to broach the subject of your marvelous Tinkham kites which have quickly made a reputation for themselves. What inspired you to design and build those Vipers, and now the new Tantrums? The initial kite was basically something do during a really tough winter, up here. We had way too much snow to fly, and I guess I was having some sort of kite withdrawal. I bought some materials and took a shot at it. It’s in a bag around here somewhere. It didn’t fly worth a darn but, it did peek my interest. Later that year, at Wildwood, I was introduced to the “French” style of flying. Richard Debray and Mathieu Mayet basically put on a clinic. It was painfully obvious that, not only was I incapable of flying like that, but the kites, that I was flying at the time also were incapable. There were two popular French style “production” kites but, it seemed that everyone would be flying those. I wanted something different and went about designing my own. I needed something that could do the tricks, yet stand up to the abuse of learning them. I started using the Viper in comps in June 2003, and have used them ever since. The Tantrum was just the next step in trying to keep up with the new tricks that seem to be invented on a daily basis. Not surprisingly, both of them were influenced greatly by what I saw in Wildwood. Do you plan to keep production of these kites in-house, or would you consider getting someone to sew sails? Or do you hope to sell or lease production/sales rights to another manufacturing company outright? Right now, plans are to keep it in house, as long as I can keep up and I’m still having fun. I really enjoy making them. If it stops being fun, I’ll stop making them and see where it goes from there. It’s been a fun ride, so far. What else in kiting intrigues you? What do you hope to accomplish in the future that you’re not attempting now? Have you any interest in Team or Pairs flying? How about International competitions? And have you any thoughts of running for positions in the AKA or in a league (Eastern League or otherwise)? I’d like to put together a demo team, to go to events and help promote different areas and styles of kiting. I’d like to have Dual and Quad pairs/team flying as it seems that it is more interesting to the general public if multiple kites are used. It seems to be easier for them to grasp than the individual, more trick oriented, routine. As for International comps, I’d love to go over, if the chance comes around. I’ve heard great things about it’s acceptance as a hobby/sport in Europe. I’d like to go see why. I’m seeing a much more international flavor to a lot of the kite forums. I feel that this can only be a good thing. I’m very interested in kiters around the world. 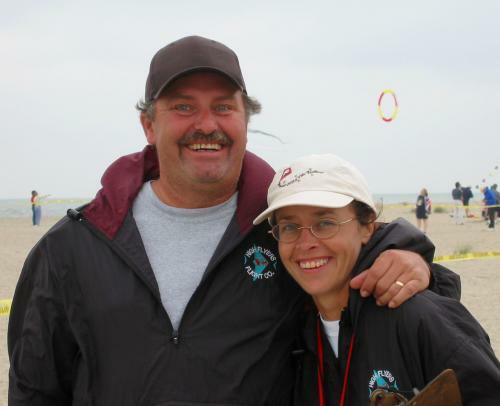 They continue to “raise the bar” for competitive kiting. I look forward to the challenge of trying to reach it. I have had the pleasure of meeting some of the top French flyers and have nothing but good things to say. They have all been great ambassadors for the sport. What are some of your favorite kite festivals, and why do you enjoy them? And which festivals or comps have you NOT attended, but would like to? Newport, RI has always been one of my favorites. It’s the first one that I attended and it is held at a beautiful State Park in Newport. Wildwood is great, if not just due to its overall size. ODSKC, in Richmond, VA is very high on the list. The wind is lousy. It’s about 100 deg in the shade and humid, yet I wouldn’t miss it for anything. This is a kite event, for kite flyers, by kite flyers. Their hospitality is second to none. Shawn, we know you got into quad line flying in the not too distant past and have been doing well with it in competition… What interested you in this part of the sport, and do you feel that the “cross training” between dualies and quads has helped you become a better overall flier? This is the newer of my flying challenges. I had tried it a few times but, never really seriously. Then came Ocean City, and my first viewing of the now famous “Bugs Bunny Routine” by John Barresi. I was floored. Total control and humor. From then on, I took quad a lot more seriously. Lam Hoac helped me out a lot when I first got started. We don’t have a lot of quad competitors on the East Coast, so it’s fun to meet at the Nationals and get “schooled” by John, Lam, Ron Despojado and others. I’m not sure if it helps with dual very much. I see them as two separate entities. This one’s easy. The people! Ron Graziano has quickly become both, my best friend and most rivaled competitor. Where else would that happen? We travel to the events together, share any expenses that we can, with lodging, car rentals, etc. to help with the cost. We then go out on the field to beat the other one. When it’s over, we go out to dinner. I’ve never been involved in any competitive situation where that happens. I guess that this also ties into my best day in kiting. Ron and I fly together often and do our best to push each other. In Dayton, anything that could go wrong for him, equipment-wise, did. This year I knew how badly he wanted it. While I would have liked to have won it myself, seeing him sweep the Masters Dual category, the first sweep ever I believe, made it my best day in kiting. As for the worst day, well, there have been plenty that didn’t go the way I planned, but I still got to spend the day flying kites, with friends. That can’t be bad. And what is it about the sport of kiting that most appeals to you now and keeps you involved? I like the way it turns everyone into kids. I love to watch the look on their faces when they see the kites. I hope to be able to share my love for this hobby with many more people. Now that you’re both near the top of the heap, do you mentor other pilots? And is there any advice you’d give to fliers, new or experienced, from around the country/world? Hmmm, “top of the heap”? 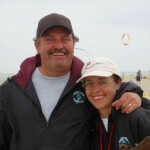 I do seminars when possible to help people either start kiting, or become more competitive. My advise, I hope that it come through clearly, HAVE FUN! For me, there are too many things in life that cause stress. Don’t let one of them be kiting. I don’t know, my guess would be, probably not. There are too many ways to be entertained, now. Maybe, with more exposure, we can reach out to a younger audience, and continue to grow. Shawn and Patty, thank you SO much for taking the time from your busy schedules for this interview. It’s always fun yakking with a couple of excellent comp pilots like this… We wish you continued success both on the field and in the kite business. The Viper appears to be a very capable competition kite, and the new Tantrum just “Rocks!” as one fellow pilot put it. It’s been fun! Thank you to John and the staff at Kitelife for keeping this thing going. When we first got involved in the sport, most of the magazines had gone out of business. I had found subscription cards to a few and sent them a check. They all came back. I would have loved to have had something like this to read. Even now, I don’t miss an issue. Also, the video archive, I have to admit, is my favorite. I never had a chance to see most of these people fly. It is a great way to see where the sport started, and where it has gone. Keep it up and if we can do anything, please, let me know. This entry was posted in 2005, Competition, General Topics, Issue 41 (Mar/Apr), Kite Making, KL Archive and tagged competition, interview, kite making, profile, tinkham.